What Companion Line Would You Like To Go Along With Possible Movie Figures? Who is the Vintage toy head that came with Oolar supposed to be now? Attendee, non-attendee, and exhibitor registration for Power-Con 2017 will open on Saturday, April 8th at 9:00 AM Pacific / 12:00 noon Eastern on the Power-Con website. 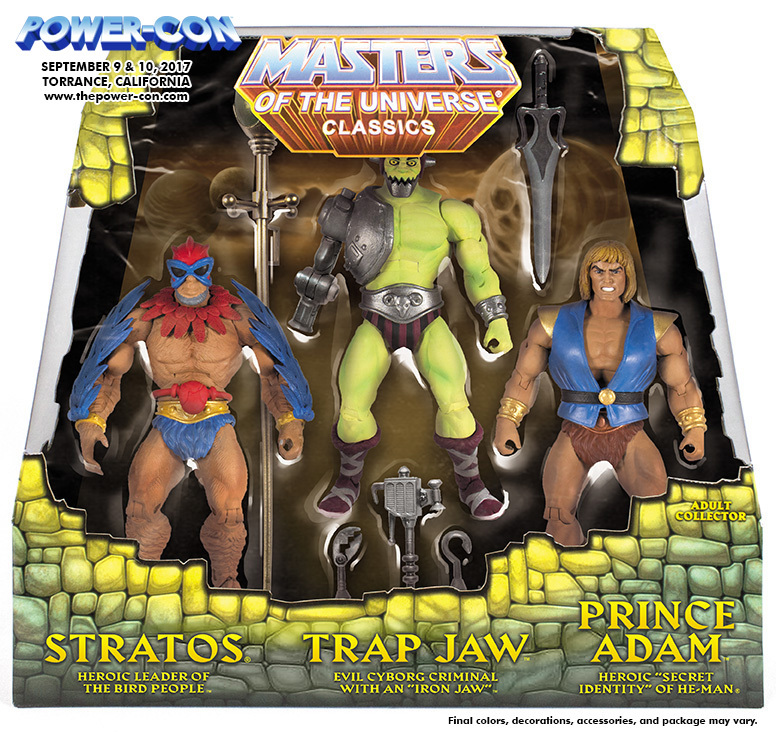 The Power-Con Masters of the Universe Classics exclusive 3-packs will be available at $105 US each for Attendees and Exhibitors. Attendees and exhibitors must be present at the convention to pick up their exclusives; they will not be shipped. Non-attendees who cannot attend, but still want the exclusives, must purchase a one-time-per-order Merchandise Access Pass of $25 in addition to the cost of the 3-packs and will be responsible for additional shipping and handling fees. Non-attendees from Germany will have two German outlets that may be able to save German fans more money off the total cost. German fans, please check back later for more details. Two more exclusives and Power-Con souvenir shirts will be revealed before pre-orders begin so please keep watching for more announcements! These additional exclusives and t-shirts will be available to attendees and exhibitors ONLY; they cannot be shipped. *Power Pass is extremely limited and includes: attendee with general weekend access to the show, guaranteed front row seating in all panels during regular show hours, access to the Green Room with beverage and snacks during show hours plus lunch, one free convention t-shirt, and entrance to the show 30 minutes prior to regular show hours.